This week I noticed that I started my blog almost exactly two years ago (yay!). Unfortunately you won’t find all my posts in English from that time, as I started to write them in two languages only a couple months ago. 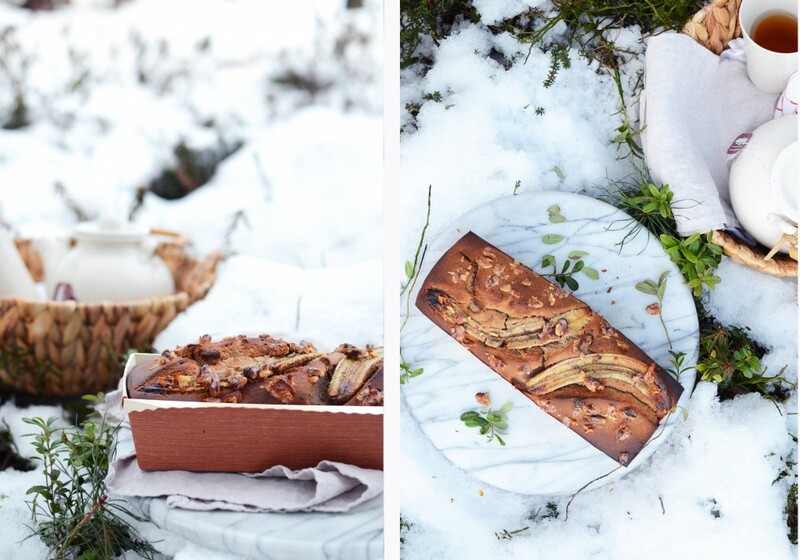 Anyways, if I’m being really exact, my blog’s birthday was on Wednesday, on that very same day when I was standing in the middle of the snow taking pictures of this banana bread. I started my blog because I thought it would be nice to write down all kinds of health tips and recipes that I had fallen for. First I wrote about all kinds of superfoods but now I mostly share recipes as that feels most natural to me at the moment. It’s kind of funny to notice how quickly things change: in the beginning I just quickly snapped a photo and wrote a short text, but now I might be planning some recipe, a photo or a story for a long time until doing it. Food blogging has also given me a great excuse to fill my kitchen cupboards and buy all sorts of pretty things. Lately I’ve also noticed that my own requirements towards my work have grown a lot. Sometimes I get really frustrated if the pictures or writing the post isn’t working as I had planned. Despite frustration and requirements, the most important thing in all this cooking, photography and writing posts is that it’s fun and brings joy to my everyday life. And luckily it has done that greatly and that’s the reason why I keep coming back here to this space. But let’s get back to these pictures just for a moment. 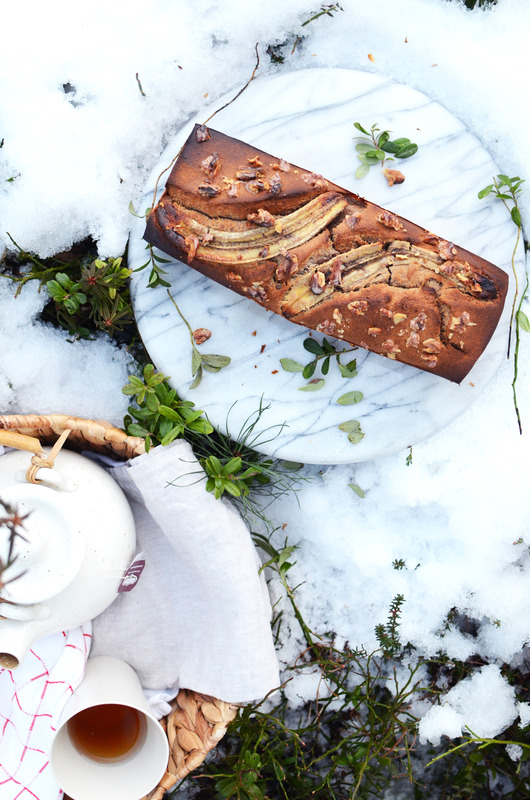 I’ve had this recipe for the banana bread ready to be shared for a while already, but then I changed my mind and wanted to tweak the recipe into a nut-free version. 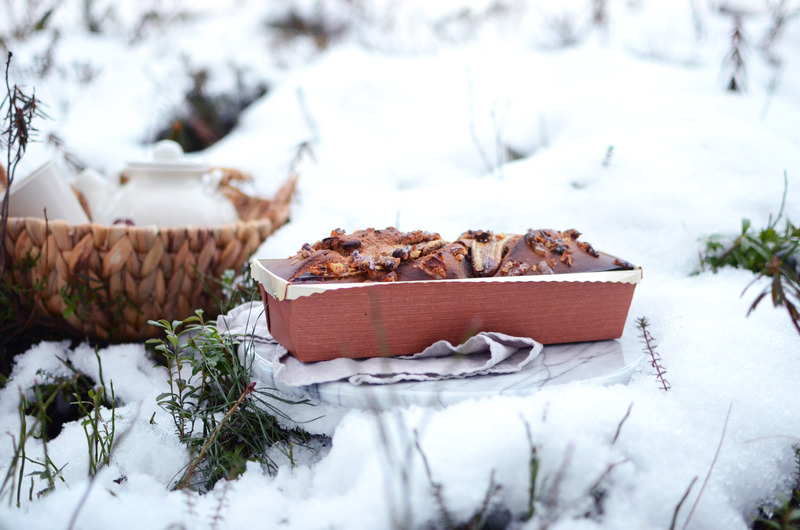 So I made one more banana bread and took new pictures while spending some time back home in Finland. Somehow I got this idea of shooting outside in the minus degrees as the snow looked so pretty. However, at some point while standing in the snow, I started to think that was I being just totally nuts. I wondered what my parent’s neighbours were thinking about my weird winter outfit and all the things that I had dragged outside. But before changing my mind, I decided that this wasn’t and should not be a moment for self-doubt. I decided that if you enjoy doing something, even how silly I might seem to others, you should just keep going no matter what. There’s always room for things that make us happy and therefore we should keep those habits tightly with us. In the recent months I’ve made banana bread more often than any other bread, just alternating the recipe a bit from time to time. I’ve made the bread with almond flour many times but this time I used buckwheat flour instead, as I wanted to offer a nut-free recipe for a change. The recipe is really easy, as you’ll only need one bowl. Banana bread is really delicious fresh from the oven, but I also like to have it with some yogurt and berries. Banana bread becomes actually even more better when you let it sit in the fridge overnight, if you have some patience. 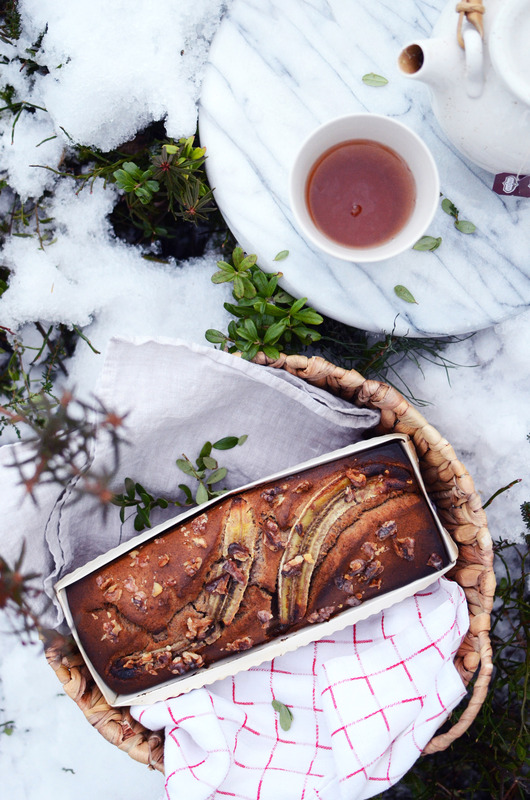 I recommend having some banana bread as a dessert on a weekend breakfast or as a treat on a winter picnic. 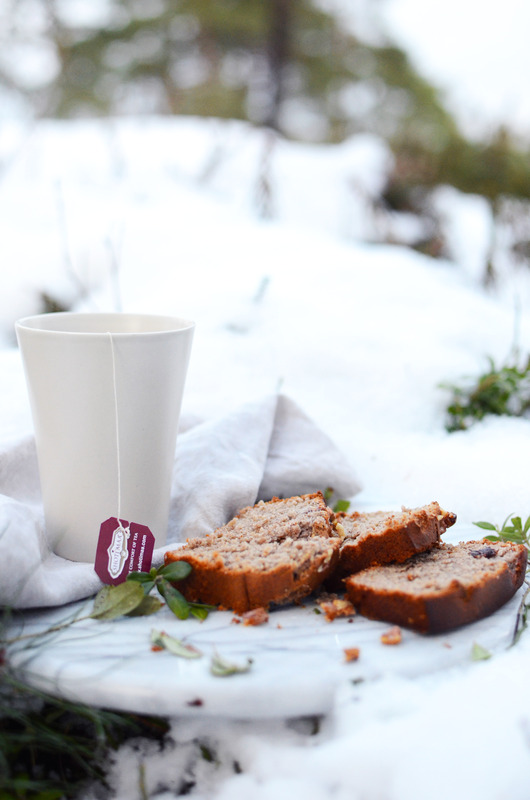 Take some hot cocoa with you and yiu’ll have the most delicious lunch or snack break while enjoying these magical winter months. notes: to make a nut free bread, leave the walnuts away. gluten free oat flour is pretty common nowadays but you can easily make it yourself too by blending rolled oats until they become flour in a food processor or a blender. 1. Preheat the oven to 175°C / 350°F. In a mixing bowl, mash the ripe bananas with a fork or with a hand blender until smooth. Mix in the spices. 2. Melt the coconut oil and add it to the bowl with the rest of the ingredients. Mix well. 3. Grease a loaf pan lightly with coconut oil and pour in the batter. Cut one banana in half, so that you’ll get two long banana halves. Arrange them on the bread and crumble a handful of nuts on top, if desired. 4. Bake for 40-50 minutes until the bread is golden. Slice and serve as it is or with some yogurt and berries for example. Store the bread in the fridge. You can also freeze some slices of the bread and then just pop them to the toaster when a craving for banana bread hits. Tagged autumn, baked goods, bread, winter.